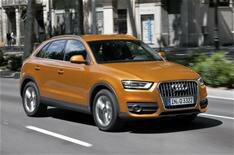 Detroit motor show 2012: Audi Q3 Vail | What Car? Audi will launch a Q3 Vail concept car at the 2012 Detroit motor show next week. Confirming the Q3 Vail for the Detroit show, Audi's CEO Rupert Stadler said: 'We see opportunities in the SUV segment.' Vail is ski resort in Colorado. It's rumoured that the Vail will be a version of Audi's Q3 SUV, with a US-style makeover and five-cylinder petrol engine. Stadler also confirmed that the A2, revealed as an electric concept car at last year's Frankfurt motor show, will make it into production. Audi will launch a Q3 Vail concept car at the Detroit motor show 2012. Bentleys new Continental V8 models make their debut at the Detroit motor show 2012. The Vauxhall Mokka SUV has been revealed, in the form of the new Buick Encore shown at the Detroit motor show 2012. Cadillac has unveiled the ATS, a rival for compact executives such as the Audi A4 and BMW 3 Series. The new Ford Mondeo has been revealed at the 2012 Detroit motor show. The Mercedes E-Class Hybrid has been revealed at the Detroit motor show 2012. The new Mercedes SL gets its public debut at the Detroit motor show 2012. The Nissan Pathfinder concept car has been revealed on Facebook just ahead of its launch at the Detroit motor show 2012. The new Porsche 911 Carrera Cabriolet gets its first public airing at the 2012 Detroit motor show. The Smart For-us concept car makes its debut at the Detroit motor show. The VW E-Bugster concept car unveiled at the Detroit motor show 2012 gives the best idea yet of what the new VW Beetle Cabriolet will look like. The VW Jetta Hybrid has been revealed at the Detroit motor show 2012. The Volvo XC60 Plug-in Hybrid Concept car makes its debut at the Detroit motor show 2012.